شرکت مهندسی تراشه ارتباطات هوشمند وارد کننده اصلی تجهیزات این برند معتبر می باشد . همچنین شرکت تزاشه ارتباطات محصولات لیگوویو را با گارانتی معتبر و خدمات پس از فروش عرضه می نمایید . شایان ذکر است که دپارتمان فنی و مهندسی شرکت تراشه ارتباطات در پروژه های بسیاری از تجهیزات این برند استفاده نموده که در تمامی موارد توانسته رضایت خاطر کامل سفارش دهنده را تامین نماید . 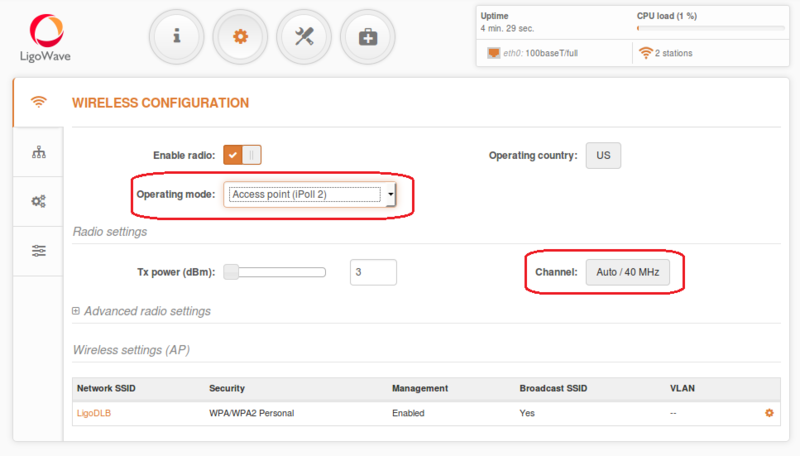 It is recommended to use iPoll 2 protocol for simple Point to Point network configuration. 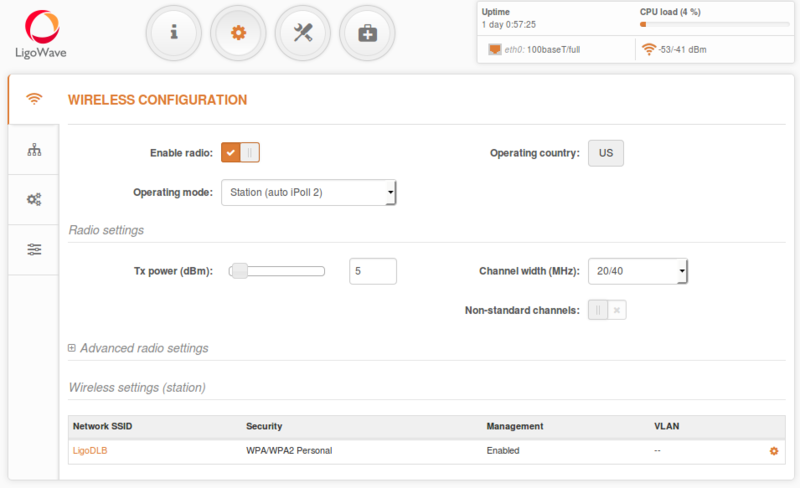 Note that Station iPoll 2 security settings must conform the settings configured on the Access Point iPoll 2 that station is associated with. Step 6. Verify the PTP link connection. Navigate to the Status | Information page. The Information page will display wireless information of the link. 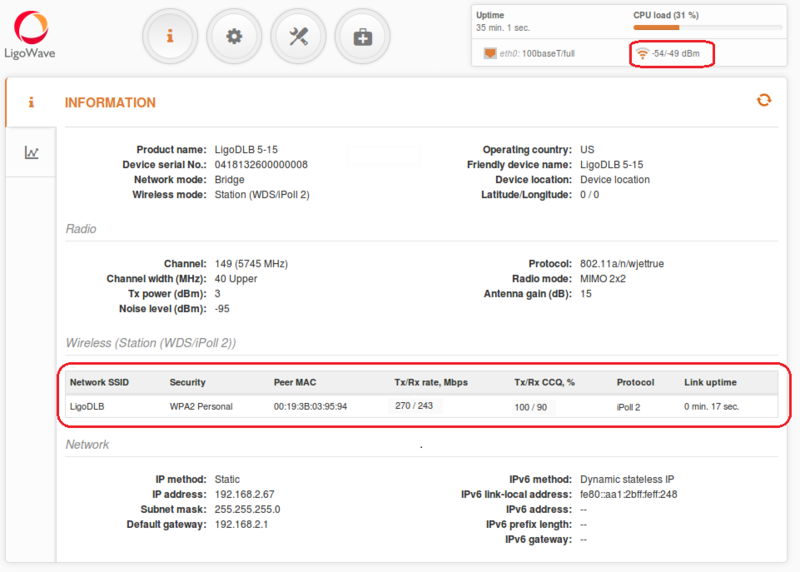 Detailed information about connected peers stays at Status | Wireless page. In a bridged (layer 2) network could be used in WDS or ipoll 2 modes. Ipoll 2 mode should be used when AP and all stations are Deliberant products otherwise select WDS mode. Recommended maximum stations per AP can be from 60 to 70. 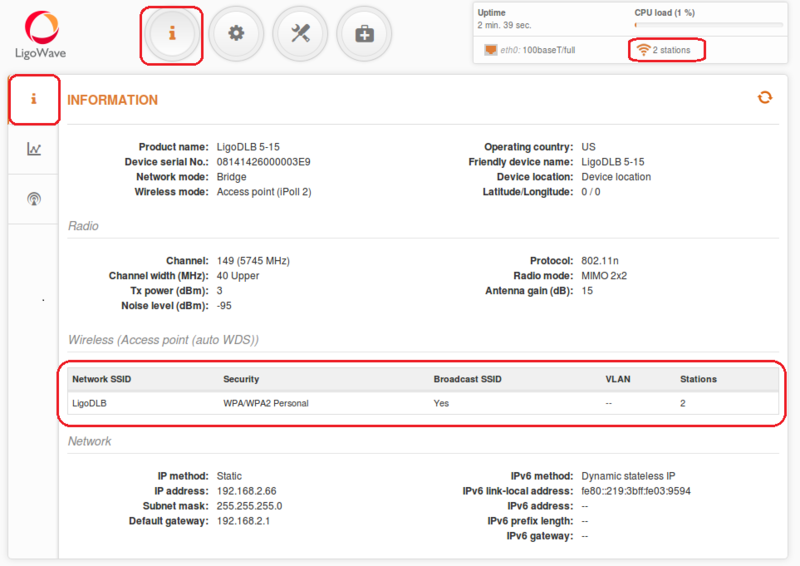 Change device’s IP address (can be static or dynamic), enable IP alias (Secondary IP) if necessary. Default ip address could be left because it is used for device management. 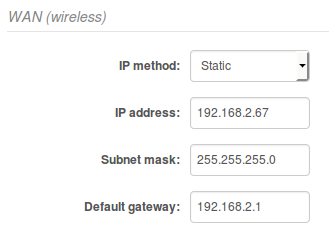 Change device’s IP address (can be static or dynamic). Enable IP alias (Secondary IP) if necessary. 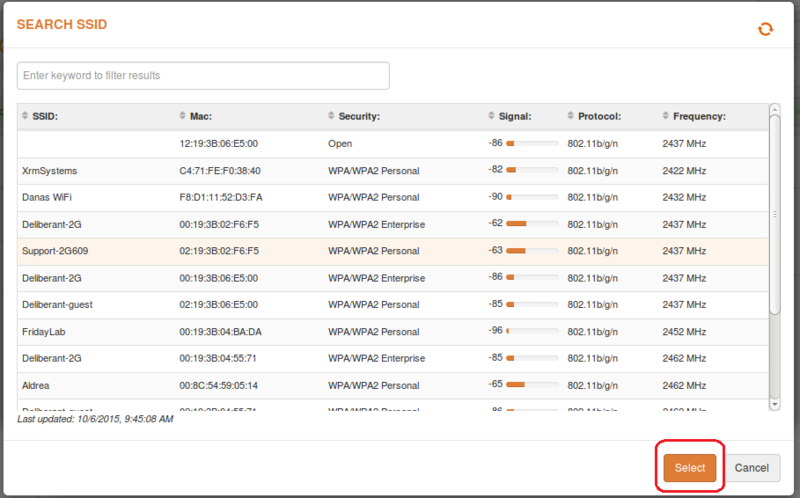 All stations ip addresses should be in the same subnet as AP is. 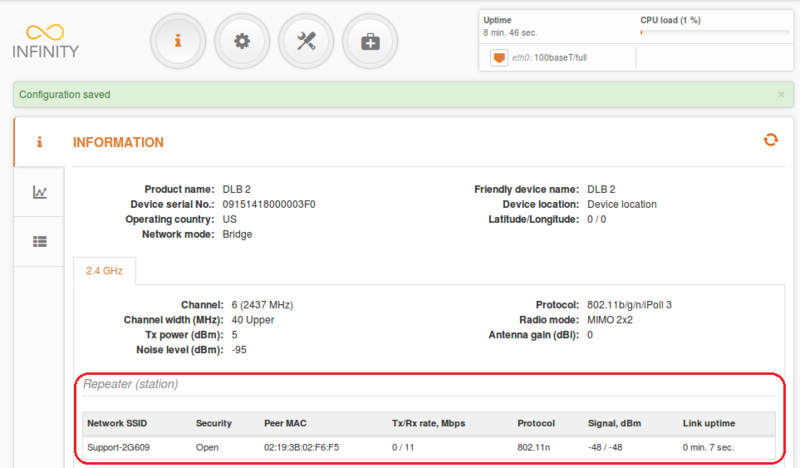 Change second device’s IP address (can be static or dynamic). Enable IP alias (Secondary IP) if necessary. Observe with indicator at Access point that all Stations are connected. Main stream is mandatory. If main signal is very weak, the link will not be stable or will not work at all. It is necessary, to align the antennas for the best main signal. If Aux stream is weak, the link will work at lower data rate. Check if CCQ is good on AP and Station and it is approaching to 100/100. 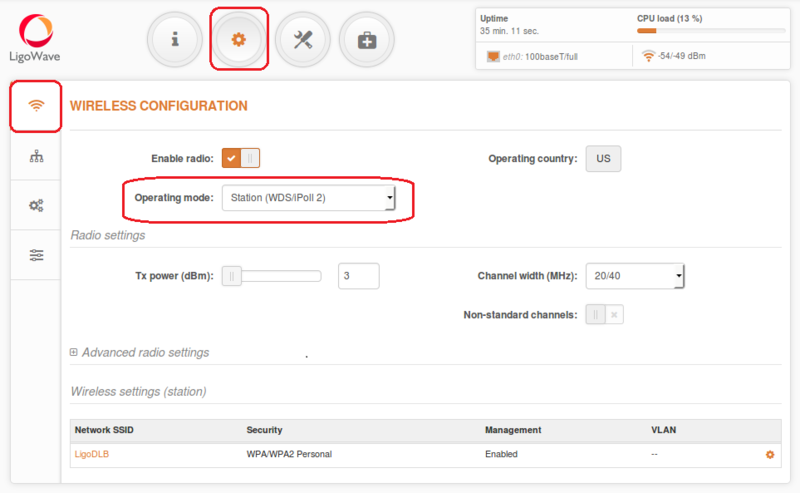 Before changing auto channel to some particular channel it is recommended to do the scan on AP and on Station (Tools|Site survey). Try to find the clearest frequency for device operation. 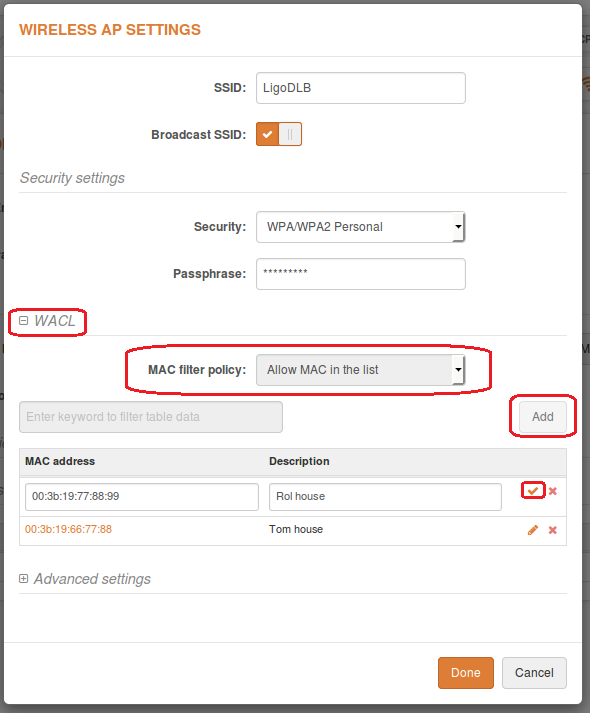 Wireless Access Control List is access control by MAC address (only in AP and iPoll 2 AP wireless modes). 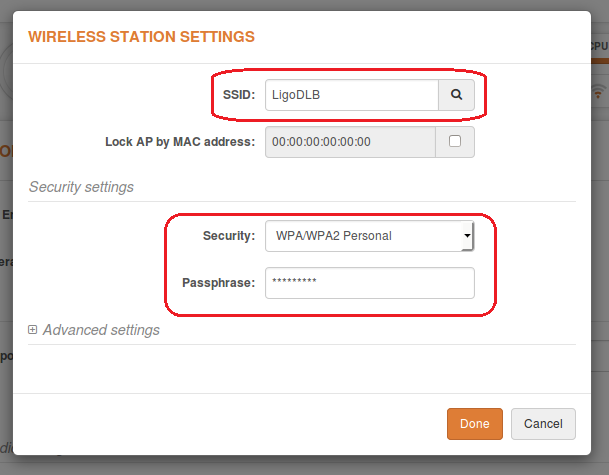 Access Control provides the ability to limit associations wirelessly based on MAC address to an AP by creating an Access Control List (ACL). 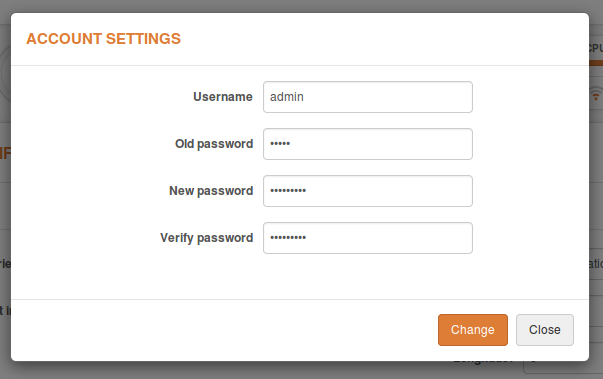 To add new rule press the “Add” button. Virtual Local Area Networks (VLANs) are logical groupings of network resources. 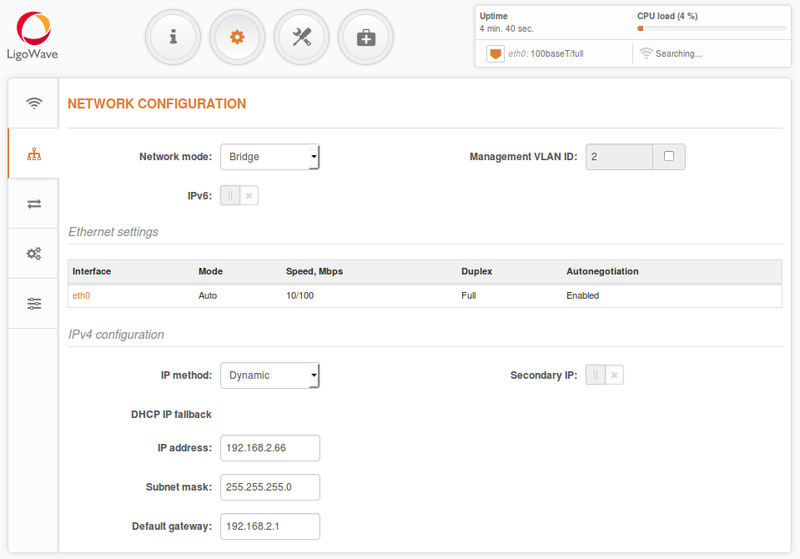 Enable management VLAN – enable a VLAN tagging for management traffic. 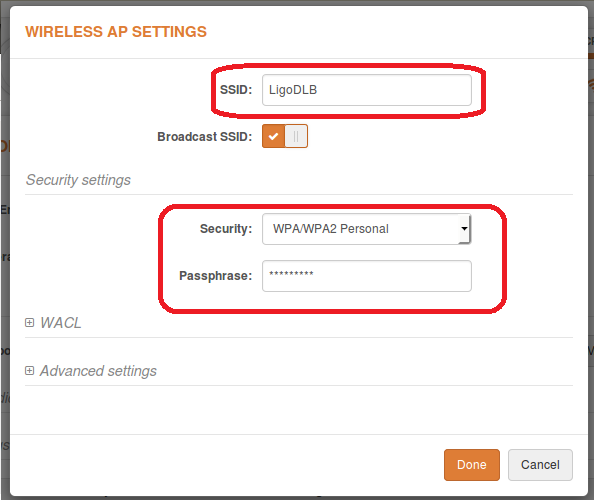 Access to the AP for management purposes can further be limited using VLAN tagging. By defining Management VLAN, the device will only accept management frames that have the appropriate Management VLAN ID. All other frames using any management protocol will be rejected. Management VLAN ID – specify the VLAN ID [2-4095]. When device interfaces are configured with a specific VLAN ID value, only management frames that matching configured VLAN ID will be accepted by device. 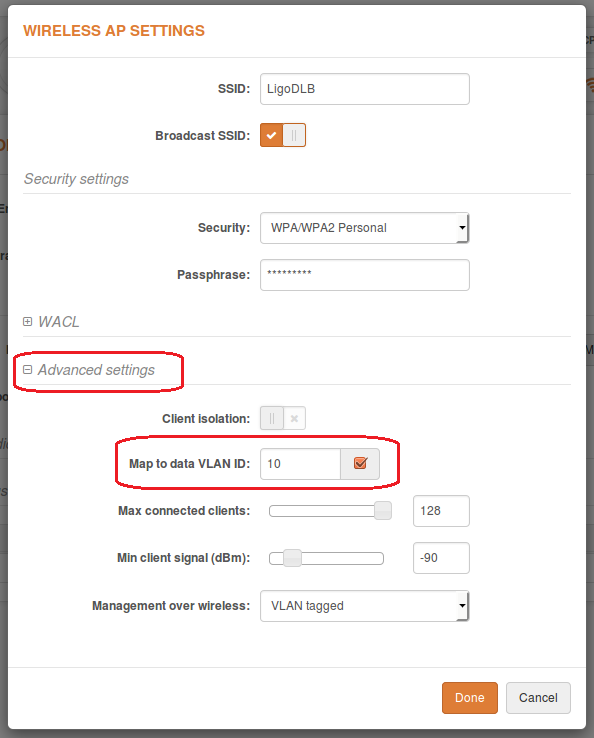 Map to data VLAN ID – specify the VLAN ID for traffic tagging on particular radio interface. 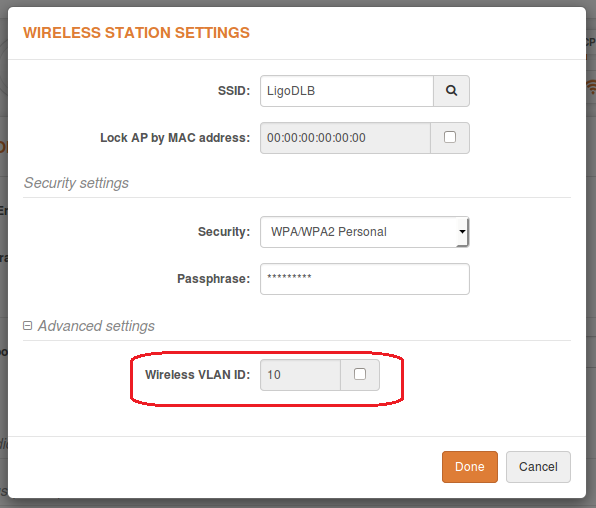 The Station devices that associate using the particular SSID will be grouped into this VLAN. Step 1. 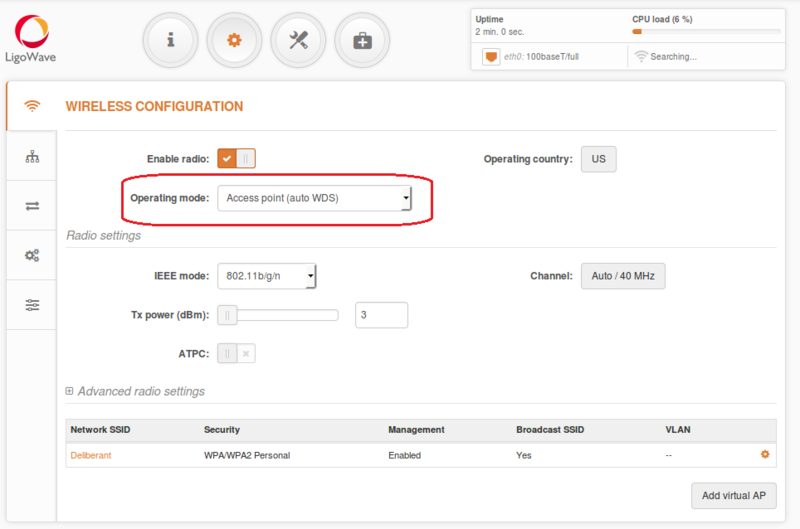 This section allows customizing parameters of the Router to suit the needs of network, including ability to use the built-in DHCP server. 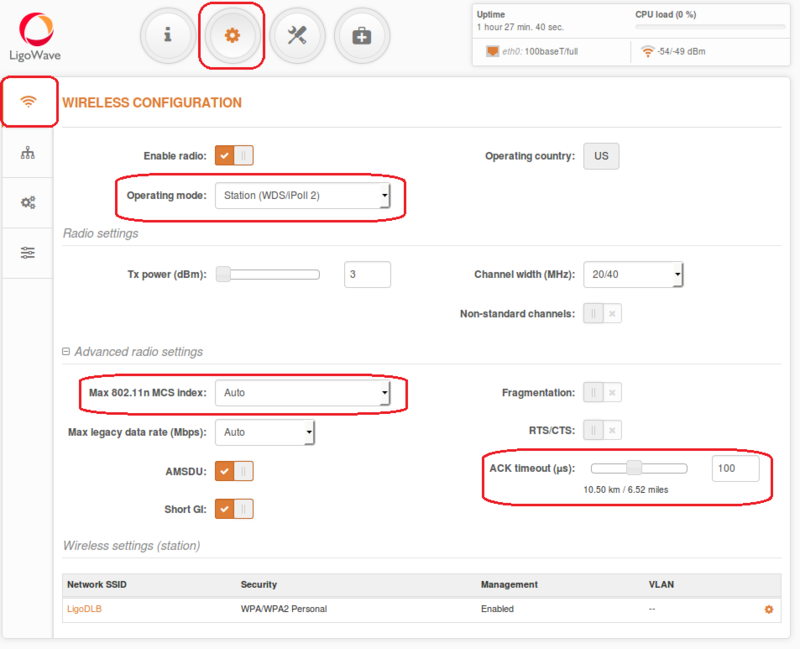 When device is configured to operate as Router, the following sections should be specified: WAN network settings, LAN network settings and LAN DHCP settings. Step 3. DHCP mode – choose server to enable DHCP server on LAN interface. IP address from – specify the starting IP address of the DHCP address pool. IP address to – specify the ending IP address of DHCP address pool. Subnet mask – specify the subnet mask. Default gateway – specify DHCP gateway IP address. Lease time – specify the expiration time in seconds for the IP address assigned by the DHCP server. 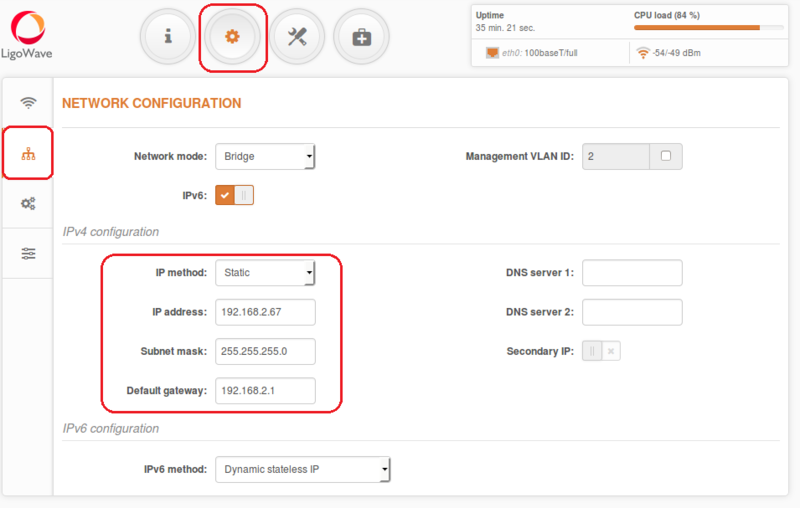 DNS server – specify the DNS server IP address on the WAN side. Step 1. 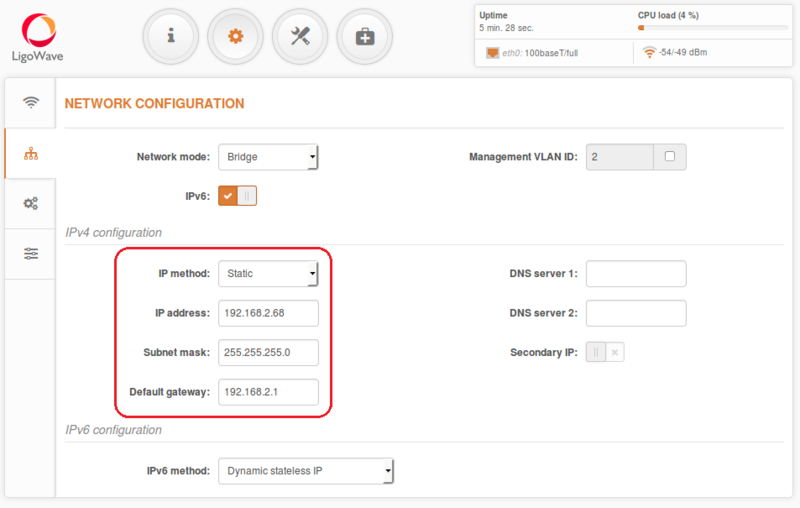 To setup IPv6 router, select the Network mode as Router IPv6 and specify the required WAN and LAN settings. With Dynamic stateless IPv6, device generates its own IP address by using a combination of locally available information and router advertisements, but receives DNS server information from a DHCPv6 server. The IP address is a dynamic address. With Dynamic stateful IP, device obtains an interface address, configuration information such as DNS server information, and other parameters from a DHCPv6 server. The IP address is a dynamic address. 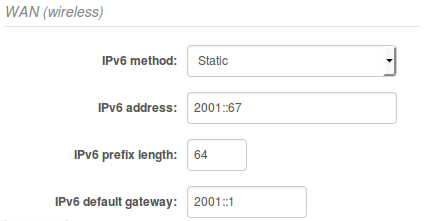 IPv6 prefix length– enter the prefix length for the address (default is 64). 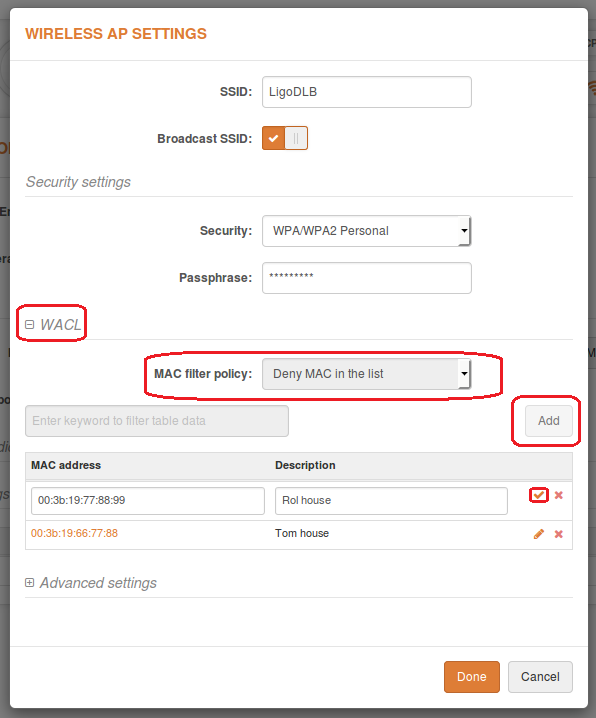 IPv6 default gateway – specify IPv6 address for default gateway. IPv6 DNS server – specify the Domain Naming Server IPv6 addresses. Step 3. 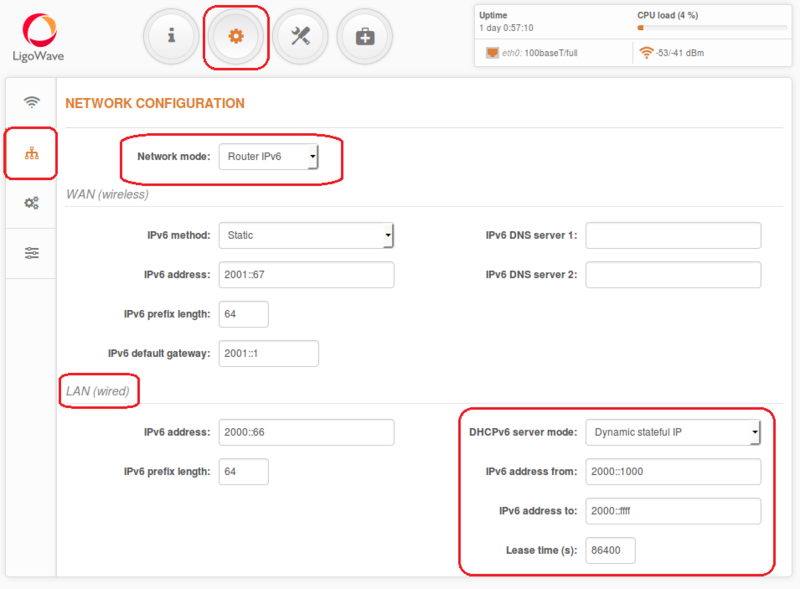 DHCPv6 mode – choose server to enable DHCPv6 server on LAN interface. IPv6 prefix length – specify the IPv6 prefix length, or keep the default prefix length (64). Disabled – select to disable DHCPv6 server. No IPv6 addresses will be assigned for clients. 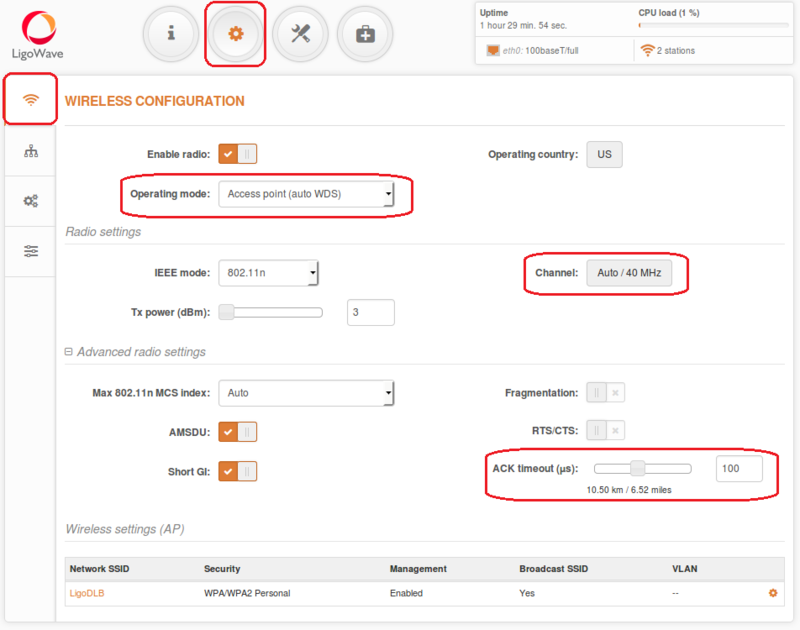 Dynamic stateless IP – select for automatic IPv6 address configuration. IPv6 address from – enter the start IP address. This address specifies the first of the contiguous addresses in the IP address pool. IPv6 address to – enter the end IP address. This address specifies the last of the contiguous addresses in the IP address pool. Lease time – specify the expiration time in seconds for the IP address assigned by the DHCPv6 server. In router mode the DLB APC will receive internet through WAN port and will share it to the LAN ports that will be separated with a different IP range. 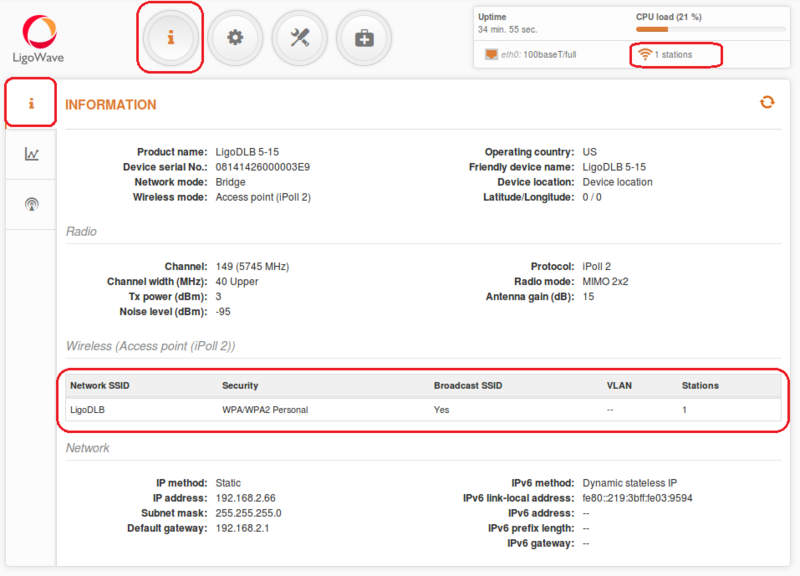 The type of connection to the WAN interface can be made by Static IP, DHCP client or PPPoE. 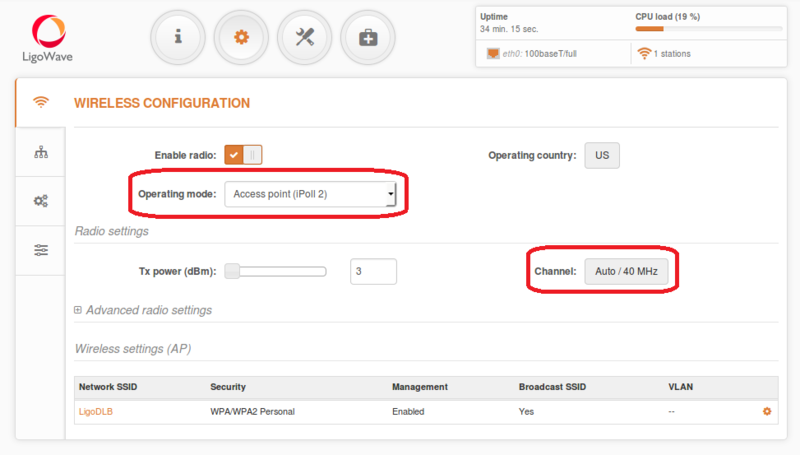 WAN mode – choose PPPoE to configure WAN interface to connect to an ISP via a PPPoE. In Access Point mode WAN will be Ethernet side in the Station mode WAN will be Radio interface. User name – specify the user name for PPPoE. Password – specify the password for PPPoE. MTU – specify the MTU (Maximum Transmission Unit) in bytes. 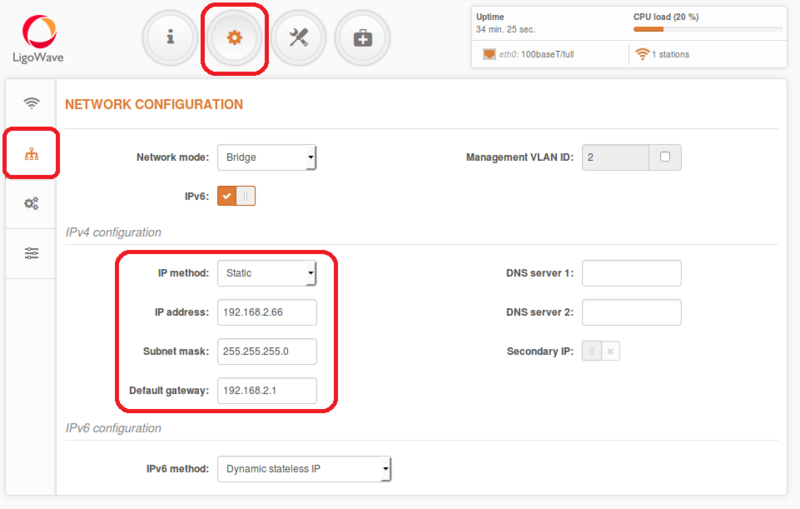 Enable secondary IP – specify the alternative IP address and the netmask for LigoDLB unit management. DNS settings – allows selecting if automatically assigned or alternative DNS servers should be used. 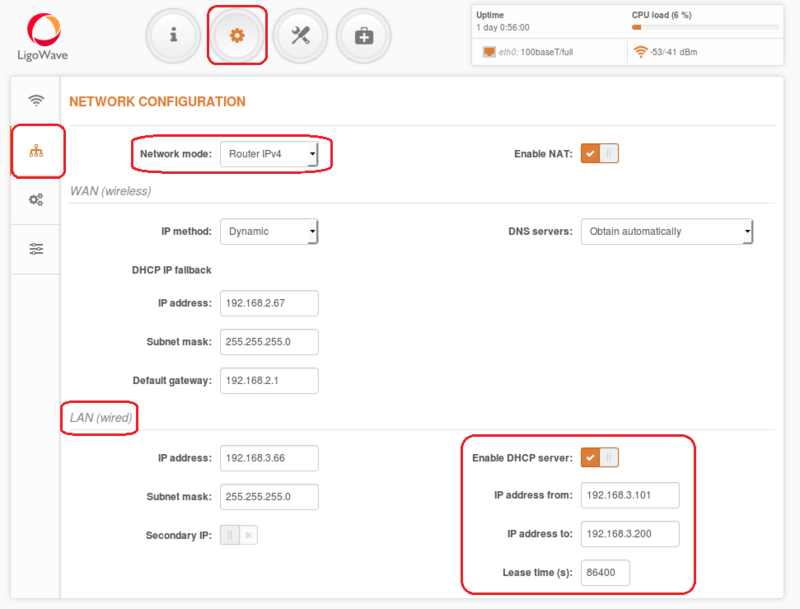 IP address – specify the IP address of the device LAN interface. Subnet mask – specify the subnet mask of the device LAN interface. Enable DHCP server – select to enable DHCP server on LAN interface. By default LigoDLB series do not have hotspot features in the firmware. 3. First upgrade the LigoDLB unit with main firmware. 4. 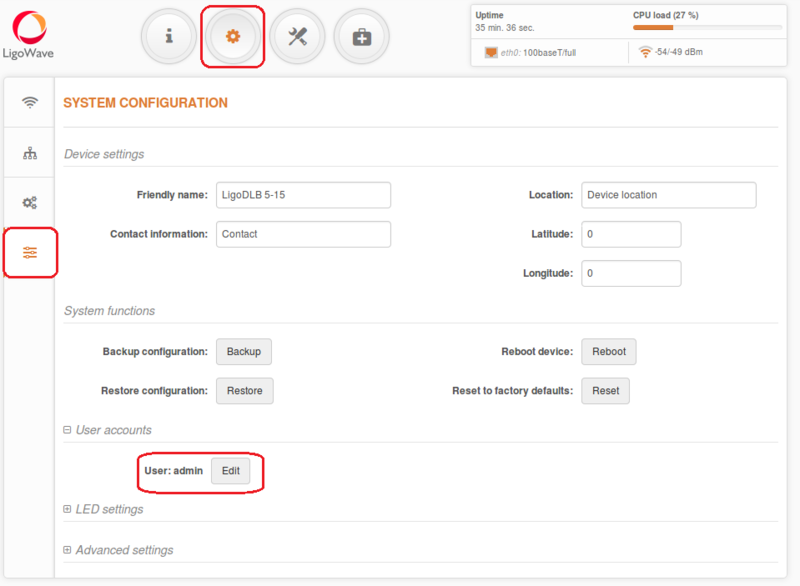 Then upgrade the LigoDLB unit with default configuration firmware. 5. Do a reset to defaults. 7. Once configured, do the firmware upgrade second time with main image in order to set the backup image for dual-boot. 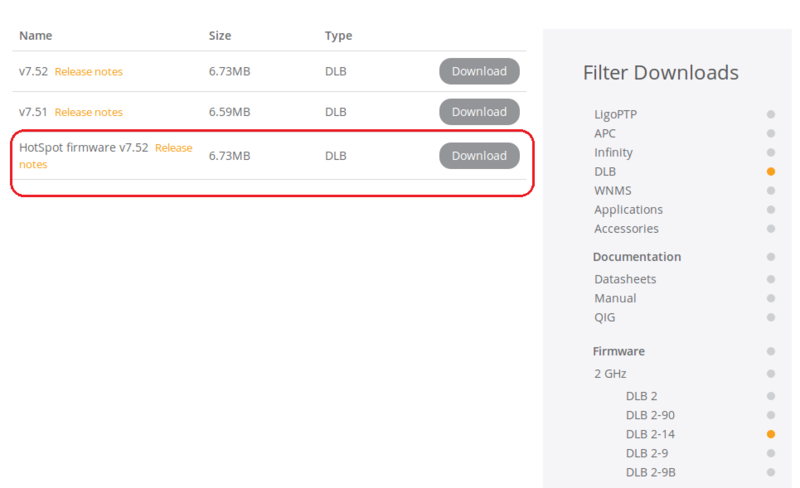 By default LigoDLB series devices do not have Repeater functionality in the firmware. Click on Save and apply to save the settings. Keep the Access point powered on and either plug the LAN connection to a live network (modem, router, switch) or just unplug from the configuration compute. Do not interrupt the firmware update. 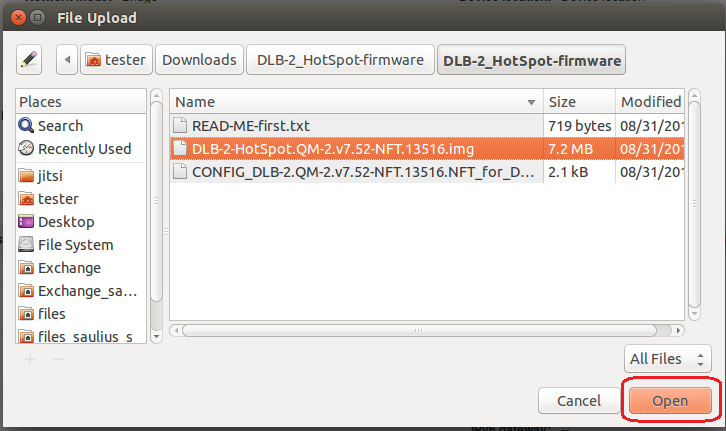 Browse to the location of the unzipped DLB-2/5_HotSpot-firmware folder. Make sure that the access point is powered up. Remember to always click on Save and apply to make all changes permanent.